Inventory We are a resale marketplace, not a box office or venue. Ticket prices may exceed face value. This site is not owned by ACL Live Moody Theater . Austin City Limits Live is a venue that is known throughout the country for its intimate setting and appeal to the most popular touring performers and groups. The ACL Live moved in 2011 from the Studio 6A communications building on the University of Texas Campus to the W Hotel in downtown Austin, TX. The Austin City Limits Live box office is located on Lavaca and 2nd street. Many of the ACL live performances are replayed on the PBS network for everyone's entertainment. The new seating capacity is around 2,700. The Austin City Limits Live Moody Theater has a statue of the iconic Willie Nelson right outside its front door. 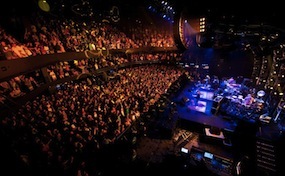 The Austin City Limits venue is a highly competitive attraction. With limited seating, the comedians and performers who seek a more involved audience make this theater a popular destination. Artists such as Maxwell, James Blake, Alice in Chains, and Bonnie Raitt have already reserved spots in this iconic location. TheaterAustin.com is a privately owned and operated company that concentrates in the online retail of all events in the secondary ticket market. We are not affiliated with any official venue, box office, and or primary supplier. Ticket prices can be below or above face value and have a tendency to change quickly with demand. To order tickets for all ACL Live Moody Theater Austin events please call our friendly operators at anytime or follow the steps online through the checkout.